If you need to buy some wine as a gift, you need to be confident in your choice; confident that the recipient will be impressed, excited and grateful when they open it. Impressed and delighted when they taste it. And even better: impressed enough that they tell others about the wine and how they received it as a gift from you. What if your intended recipient is a wine enthusiast? What if you buy something they don’t like? What if your choice looks obscure and random (or worse, boring)? And, if you are buying on behalf of the company, you need to have reasons to tell your colleague or boss about why your choice will make a great gift. Wine is a great gift because most fine wine has a story behind it that you can share (or just keep in mind) to make it a richer experience and a more memorable gift, or at the very least, a good choice. You can describe something special about the wine on a gift card or you can keep it up your sleeve for when you talk next with the person you are giving the wine to. It doesn’t have to be a lengthy story. Often just one line will do. For example: ‘This wine came from one of the oldest vineyards in the region’ or ‘This was made by a former television executive who completely changed her life to become a winemaker’. See - one line makes an intriguing story that can sit behind your choice. Look at the back label or visit the winery website and check the ‘About Us’, ‘History’, ‘Our Approach’, ‘Our Winemakers’ or ‘Our Vineyards’ section. Within a couple of minutes, you’ll find something unique and interesting. Look for organic or biodynamic viticulture, a historic vineyard or an interesting story behind the establishment of the winery. It could be a wine made by a recently awarded winemaker. Or the result of a specific technique in the winery (like minimal intervention or using gravity instead of pumps to transport the wine between tanks in the winery, for example). Or a technique in the vineyard, like biodynamic viticulture. See if you can find one of these unique aspects of the wine, its origins and makers. Then make mention of it in a note or when you talk to the person you are giving it to. This will make your gift unique and memorable. Most likely they’ll remember the story every time they see the bottle in their cellar or when they share it with others. I’ve done the hard work for you in covering the fundamentals. 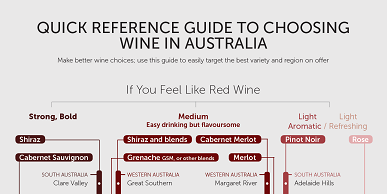 I only make recommendations for wines that come from great regions, from wineries with great reputations and with solid reviews from independent wine critics. If you’re just looking to buy one great red wine as a gift, look no further than this article: Seven reasons why this wine makes a perfect gift. If you want more to choose from, here’s a collection of wines that make perfect gifts, from the Christmas catalogue of one of Australia’s major online retailers. I have identified only three of the wines in the catalogue that meet the requirements of the fundamentals listed above. Alternatively, have a look at this collection of high-end wines that would make for ideal gifts. Each formed part of a bracket in a recent tasting I facilitated. Each was a standout example of the things that contribute to the character of fine wine (climate, variety, bottle age, etc) and each has a story you can use for writing a note with your gift (even if it is a one line story like ‘this wine is a highly-regarded example of inland cool-climate Shiraz’). My friends at Ngeringa in the Adelaide Hills have an amazing collection of biodynamic wine that would make perfect gifts with an interesting story. I hope you continue to build your wine wisdom and that you have success in your wine gift purchases. Feel free to get in touch to ask questions.